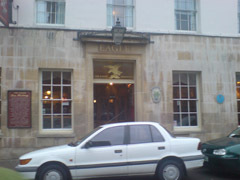 The Eagle, Cambridge, CB2 3QN. The Eagle pub review, map and rating. Looking for a Hotel near The Eagle? Nothing special except the interior and the history. Beer selection was common. Seating was minimal inside but they do have a fair sized covered balcony out back for smokers.